This week, Dr. John Ryan, ASL’s Chief Strategy Officer will be attending the 2017 Greenbuild International Conference and Expo in Boston. It is a great opportunity for Allergy Standards to meet with top leaders of the green building sector and bring our professional insight on how to improve indoor air quality. John Ryan will attend the seminars and the plenaries that will take place during the event and will thus be able to interact directly with all the other attendees including architects, engineers, developers, government agencies, green building thought leaders, building owners, interior designers and sustainability officers. ASL addresses the growing trend towards healthier living by creating scientific standards to test a variety of consumer products and services. Products & Services which pass testing can then utilise the Certification Mark to show consumers the high standard they have achieved. The Certification Mark asthma & allergy friendly® is now recognized throughout the world as a trusted independent verifier, demonstrating that Certified products & services truly are a better choice for people suffering from asthma and allergies. As a matter of fact, the PureSafety® insulation product made by Owens Corning, that passed the ASL scientific standards this year, was awarded as a Top Pick innovation 2017 by Home Depot. 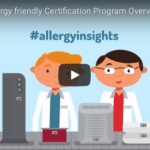 LAUNCH OF OUR NEW VIDEO The video outlines the reason why the asthma & allergy friendly®® Certification Program exists and what manufacturers need to do to have their products certified asthma & allergy friendly®®.